While MUG Root Beer is a staple in the American soft drink world, it’s look and appeal had become dated since it’s 1986 introduction to the market. To attract a larger consumer base to this delicious product, the Lien Design team updated its packaging, creating a package design that was more contemporary and youthful to draw the eyes of children and teens who weren’t brought up on the beverage. RETURN ON INVESTMENT: Our design proved to be successful and after the bottles started rolling out of the distribution plants with our redesign on them, MUG Root Beer reported an increase in over 6% by the end of the next fiscal year! Lien Design’s redesign of this boutique treat led to the company reporting the best sales in the company’s 30-year history. On top of that, this package design was the winner of the International Design Awards in 2013. Lunchables have been a long-time staple of American school lunches; however, when their sales started to droop they came to Lien Design for a fresh and updated redesign. For our team, the key in this project was to synthesize over 15 years of consumer loyalty with a recognizable-but-new overall look. Elements of the logo and the packaging were revamped to appeal to more timely tastes (especially in the font and the eye-catching colors that were used), and the newfangled creative package design proved to appeal to both parents and kids. RETURN ON INVESTMENT: After implementing Lien Design’s new packaging, Lunchables continues to hold the #1 spot in the children’s lunch category, and has since been on a constant rise across a number of other groceries categories! While CQ Mixer’s original package design left much to be desired, the Lien Design team saw the potential in the product, creating a vibrant and modern look that helped it thrive in the alcohol industry! Despite having virtually no advertising budget whatsoever, the sleek appearance of the redesigned CQ Mixers caught the eyes of consumers across the country. Within the first six months of launching with Lien Designs package design, the product was picked up and sold by a number of large franchises, including the Hyatt, Marriot, and Ritz-Carlton hotel chains. RETURN ON INVESTMENT: Within the first year of their packaging redesign, CQ Mixers saw an astounding 231% increase in their sales! The extensive market research and numerous design options explored by the Lien Design team helped put the product in a completely different category that many of its competitors, and helped it find a niche within a smaller, stable market with the hotel chains as well. This redesigned line of packaging for a yummy grocery item ended up not only winning a 2014 American Graphic Design Award, but soon after the company rolled out the new package design the product was picked up to be sold in Whole Foods Markets across the country! Teaming with the well-known RedVines product to redesign a package that would separate it from its competitors, Lien Design utilized elements of the popular candy’s original branding design elements to breathe new life into the treat. We even elevated the taste appeal by incorporating a tantalizing image and created a more playful and inviting product—all while using the product’s existing brand equity as leverage! RETURN ON INVESTMENT: Lien Design’s redesign of the new line of Sugar-Free Vines became the best selling product in the company’s lineup, and still maintains its market dominance over seven years later! This familiar brand design by Lien is used on over 500 products in CVS stores across the country. Versatile, simple, and memorable, we worked on creating a branding style guide that would translate across dozens of products in many fields, and it’s been used for over 15 years! Sales Boost of 5%—to $3.9 Billion! Though Huggies has proved to be one of the world’s most popular diaper brands, the company was having a hard time appealing to consumers from upper-income households. Low- and middle-income families had long been fans, and Lien Design’s package redesign of the niche product Huggies Supreme drew new eyes to the brand. RETURN ON INVESTMENT: After Lien Design’s value-added package redesign in 2003, Kimberly Clark’s sales rose more than 5%—to $3.9 billion!—establishing an all-time quarterly record for the Huggies Supreme product. I’m happy when my clients are happy! 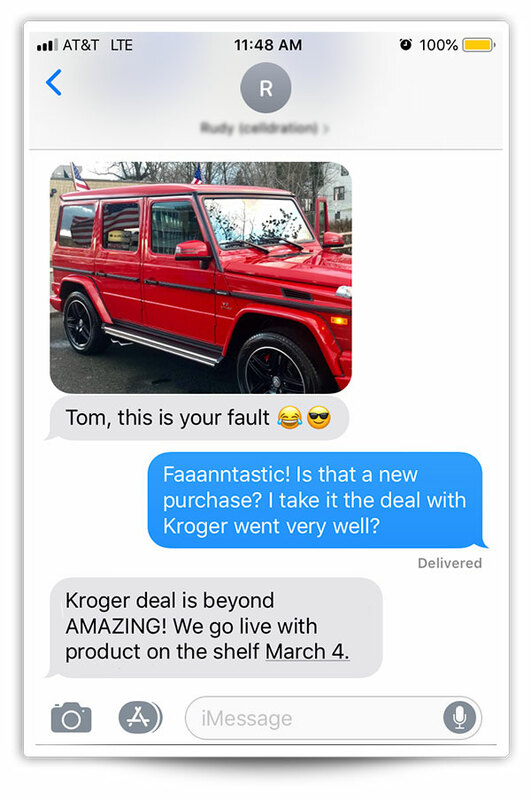 This was a spontaneous text message from one of our clients about the amazing deal that happened recently because of our redesign of their product. Keep reading below to see some of the other fantastic success stories we’ve created for our clients over the years.